One of the highlights I experienced in 2015 occurred when my colleague and friend Helene Cahen and I had the chance to share an immersion experience in the Silicon Valley. The visit was organized by the Conference Board of Canada and brought together a group of executives from major businesses, governments and universities in Canada. We had an amazing week in the Bay Area, focusing on innovation practices, exchanging perspectives and contrasting the Canadian and the Bay Area approaches to innovation. We visited and learned about different organizations’ approaches, such as those of Stanford biotech, Xerox PARC, HP Campus, Johnson and Johnson Janssen division and more. There appeared to be quite a bit of Silicon Valley envy occurring in the Canadian group as we all experienced how embedded innovation is in the culture of Silicon Valley. Here are a few key insights about what we observe as the differences between the Canadian and the Silicon Valley approaches to innovation. Helene: Collaboration is ingrained in the DNA of the valley. Janice: Participants at the session appeared to be repeatedly surprised and in awe of the level of collaboration evident in the Bay Area. In general, in Canada, we appear to be novices at the concept of collaboration and concerned about what we would lose, rather than gain, if we shared. In my work with clients where we are building innovation capacity and cultures, I attribute hesitancy to collaborate to a lack of understanding around the underlying creative process in innovation. With innovation, a variety of perspectives and input are required to introduce new products, services or processes. It is critical that we develop the comfort of sharing early, often and beyond the obvious immediate circle in which we work. We had a fascinating presentation by the Janssen division of Johnson and Johnson, where they explained why they decided to offer a shared space within their company, where start-ups and small businesses in their medical field can rent office and lab space as well as share common services. The benefit of the co-location for Janssen is the opportunity to discover potential partners and acquisition opportunities at very early stages of their innovation processes, while limiting the risk and cost of internal innovation projects. Janice: Synergies, cross-pollination of ideas, random opportunities; getting multiple groups of people together in the same spot, all focused on innovation, is bound to create opportunities for cross-pollination, collaboration and partnerships. Some of the organizations I work with have embraced the concept of co-located or shared spaces to support innovation, while others are just starting to explore the possibility of establishing these innovation labs. Unfortunately, I’m hearing feedback that senior managers are finding the concept a bit too innovative and so there is a need to innovate on how to achieve an innovation lab. In Canada, for start-ups, entrepreneurs and people interested in using innovation to create social change, many cities do have shared spaces or resource centers where opportunities for cross-pollination around social innovation can occur. One such organization that I enjoy is the HUB which has locations in Ottawa http://ottawa.the-hub.net and Halifax http://www.thehubhalifax.ca, and three locations in the Bay Area http://bayarea.impacthub.net. If you don’t have a dedicated space, the opportunity to create a co-located space can be event-centered. When we’re working to embed innovation process in client organizations, we find a shared outcome everyone can collaborate to achieve, and we dedicate time and space for everyone to come together around a particular part of the process, or to take the time to share lessons learned about their adventures in applying innovation to their work. Imagine the level of engagement you could create in your organization if you planned events where you invited teams to work in the same location for a specific amount of time. In my experience with clients willing to create space and opportunities for co-location in their offices, even if it’s just temporarily to support collaboration during the phase of a project, great thinking and results emerge. Helene: The idea of immersion and ethnographic approaches to understanding challenges is becoming more ingrained in businesses and universities in the Bay Area. For example, we visited Stanford’s Biodesign program, where they accept 12 fellows every year to develop new solutions in the field. These 12 fellows start their nine-month fellowship with one month of technical learning around the topic of focus for the year, two months in clinical immersion in the Stanford hospital and another month summarizing what they learned by identifying 200+ needs. Only after four months of understanding the needs, do they narrow them down to a few more promising needs upon which to start working on solutions. When did you last spend 40% of your time understanding a challenge before working on solving it? Janice: The fact that these fellows at Stanford spent four of nine months understanding the context, issues, challenges and needs in a specific focus area before they were able to generate ideas, prototype solutions and bring them to market seemed astonishing to the Canadians on the tour. This reality really helped to frame the importance of settling on the “right” problem to solve to improve chances for finding better, or even extraordinary solutions, which would lead to breakthroughs in the organization and improve chances for commercialization. This typically was not the problem-solving experience in the majority of organizations represented on our tour. In my experience, until they have adopted a deliberate process for innovation, organizations do not appreciate the value of exploring and framing a challenge from multiple perspectives. They tend to ignore the assumptions they hold about the problem and focus more on implementing a quick solution, and do so without involving end users and stakeholders in the process. 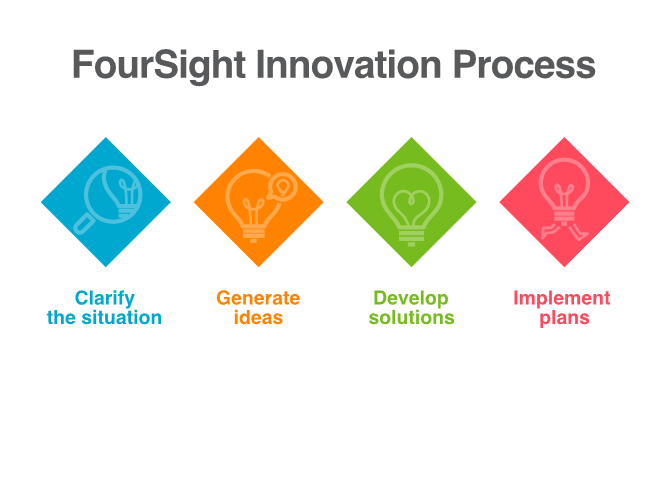 The innovation process Helene and I typically introduce to organizations is FourSight™, which conceives innovation in four stages: Clarify, Ideate, Develop and Implement. Once they understand this process, organizations start to value the time spent in clarifying as it helps them focus on the right problem, create alignment to organizational goals and generate meaningful solutions for stakeholders. Janice: I think in general we’re not really comfortable with the concept of failure in Canadian organizations. The fear of failure appears to create a tendency to risk aversion. Innovation doesn’t have to be an all-or-nothing proposition. What if we were to approach innovation as an opportunity to experiment and to create early learning and opportunities about what will work better? Inherent to the innovation process is a requirement to regularly engage in reflective thinking to drive key learning and support continuous improvement. Helene: Once you embrace the concept of failure, it becomes critical to be able to evaluate your solutions early and often to avoid spending a lot of time, resources and money on solutions with limited potential. The way to do this is to create a process that integrates prototyping and testing early and often; iterating many times to integrate user feedback and getting more defined and thorough in your approach once you have seen some interest in your solutions. For example, when we visited Xerox PARC they described their own process to start testing and evaluating their MVP (Minimum Viable Proposition) early and often, as their way to save time and money using what they describe as a “real options mindset,” where they keep testing the MVP with customers, and doubling the investment when the information comes back as positive. Janice: In my own experience with clients, the practices of prototyping, testing and iterating are not well ingrained. In reality, this practice is a way to run controlled experiments and decrease risk while saving time and money. Organizations that use these practices have benefited from learning and insights that ultimately create better responses to the challenges they are facing. Our takeaways are not that every organization should aim to be a Silicon Valley type organization. Rather it makes more sense to learn from their successes with building an innovation culture and identify how Silicon Valley organizations’ best practices can be successfully implemented within your own culture and constraints. How might you embrace the uniqueness and reality of your culture and processes while moving towards embedding more innovation? When working externally to your organization, such as with a stakeholder or potential partner, use a collaboration protocol; share your contact info, value interdependence, look for what’s possible, create win-wins, and keep open to novelty. When working internally to your organization, the same protocol you would use externally applies. A known fact of innovation is that multifunctional and diverse teams are more likely to create innovation. Focus on working across silos, creating alignment to corporate goals so there’s a broader win to your efforts. Be clear on roles and responsibilities in the collaboration, do what you say you will to build trust and make sure everyone who participates has access to the work products and information they help to create. In Silicon Valley, the use of Design Thinking appears to be prevalent. 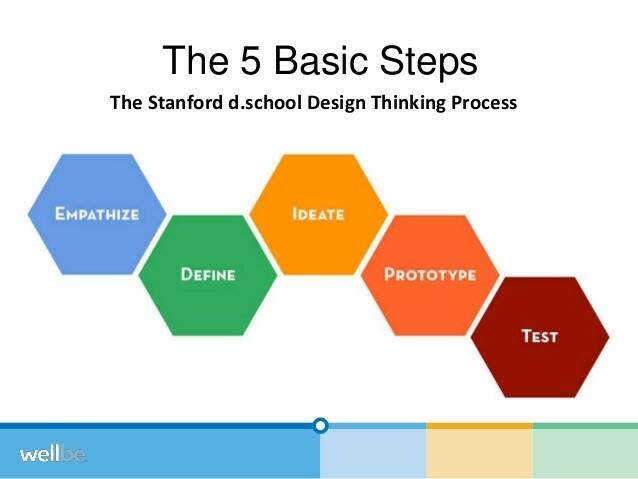 Design Thinking was developed out of the d.school at Stanford University and is used at IDEO, a major design consulting firm. It’s great for new or enhanced product and service development opportunities. It could even be applied to process development, however it might not lend itself too well to the day-to-day problem solving many organizational teams need to work through. At Stanford Biotech they use a process called biodesign, the process of innovating medical technologies. We (Helene and Janice) both use and teach an all-purpose innovation process based on creative problem-solving called FourSight™. It offers a simple, four-step process to help you clarify and explore an opportunity or issue, and then to generate, develop and implement ideas to resolve the issue. We like it because of the ease with which it can be accepted, adopted and implemented as a process for innovation. It uses a common intuitive language that makes it easy for people to grab onto, even if they haven’t been formally trained in how to use it. It includes a psychometric assessment that helps people understand how they prefer to engage in creative thinking and how they can bring their best thinking to work. And finally, because it plays well with other models, you can use it on its own or within any business process or practice that you’re already using. © 2014 FourSight LLC. Used with permission. Watch the Welcome to FourSight video http://foursightonline.com/pages/welcome-to-foursight to learn more about how the model can help your organization collaborate, communicate and solve problems more effectively when you engage in innovation. Anyone who may be impacted by your innovation or change, in any way, is a stakeholder who must be engaged in your efforts. And we don’t mean send stakeholders a memo to tell them about it, we mean bring them into the fold to engage in problem framing and solving with you. You need to understand what you want to do from their perspective. The reality is, if you’ve got an idea on how you can improve or revolutionize a process, product or service, and you aren’t truly engaging your users and the “supply chain” in the process, you’re creating a whole lot of headaches for yourself. Instead of smoothing the way to implementation, you’re creating resistance, impeding adoption, and missing out on discovering critical information that can shape your ideas and inform your decisions. Innovation is about creating value and you won’t fully understand or appreciate the value you can create without all your stakeholders being engaged throughout the process. Here’s where we direct you to go back to our Takeaway #1: Create safe havens for collaboration.